Senior guard Cy'erra Mills, 21, scored a team high of 15 points against Lander Bearcats. For 34 minutes the Francis Marion University (FMU) Women’s Basketball team led the conference-leading Lander Bearcats. The game however is 40 minutes long and with a huge 21-6 run to end the game the resilient Peach Belt Conference (PBC) leaders rallied for a win and stole the 79-74 victory over the lady Patriots Wednesday, Jan. 28, at the Smith University Center. The game was quick from the start, and both teams came out with something to prove. The lady Patriots were thinking it was a beautiful night for an upset and they hit the gas right from the start. They grabbed the lead and held it until the last three minutes left in the heated PBC matchup. The game was stop and go as the officials took a conservative stance on the rulebook blowing the whistle what seemed like every couple of seconds. The players for both teams showed the frustration with the constant stopping throughout the game. The lady Patriots played through it and thanks to a 13-6 run to end the half FMU had the lead 41-36 at halftime. 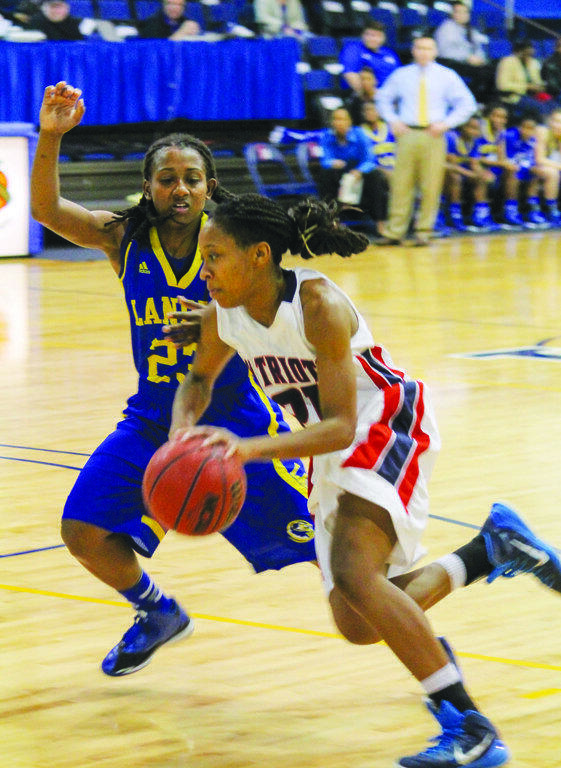 The lady Patriots kept on pushing and continued their excellent shooting from the floor in the second half. With the good defense they increased their lead to 14. It was looking promising to those packed into the stands to watch the conference leader get dethroned. The tide turned, and things started spiraling out of control as the lady Pats only sunk 3 of 13 attempts in the final seven minutes of the heated contest. They were also plagued with the turnover bug. In the final minutes, Lander forced eight FMU turnovers. The game was quickly turned around, and with three minutes and some change left on the clock, it was all knotted up at 70. The lady Patriots lost the lead for good when Bearcat Mylea Mckenith sunk a clutch free throw to put Lander on top 71-70. It would be an intense last minute as FMU fought to regain the lead, but four back to back free throws from the Bearcats would put the game in the record books for good. The lady Patriots might not have come out on top but they had outstanding performances including a career best from junior center Alaysia Watts who had 12 points and snagged nine boards. Junior Cy’erra Mills led the team with 15 points and helped share the wealth with an impressive five assists. It was a team effort from the lady Patriots as the bench chipped in 28 points in the nail biting defeat. FMU looks towards the future as they go on the road for three straight conference matchups starting Saturday, Jan. 31. They return home after the long road trip on Feb. 11 against Armstrong State.